As we move into summer vacation season, our office staff are taking off for beaches, museums, historic sites, and other attractions around the U.S. Talk about all those plans in our weekly meeting, brought back memories of one of our favorite projects from years ago…. A quarter century has passed since Sea World of Florida turned to Randy Burkett Lighting Design for a fresh look at illuminating ocean habitats for their aquarium park in Orlando, Florida. A new world-class coral reef experience was to be built at the Florida destination alongside an existing, but somewhat dreary appearing shark encounter. 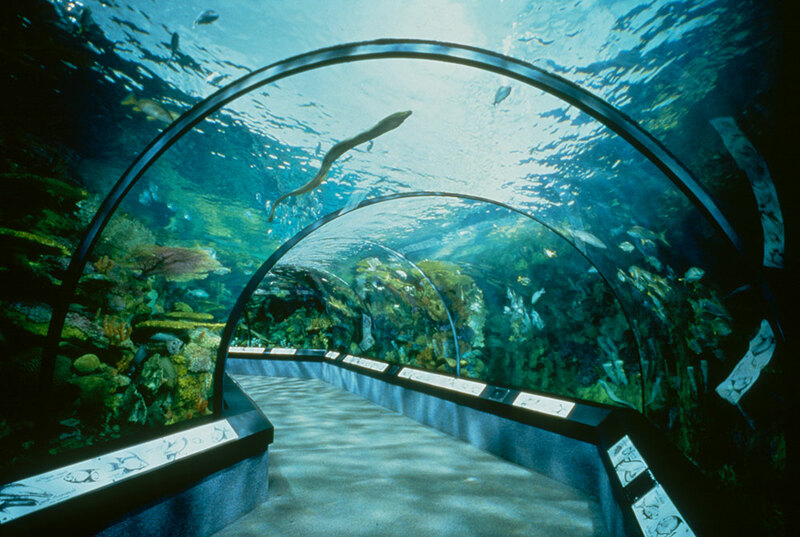 These salt water tanks, two of the largest of their day, were uniting with a number of smaller poisonous and venomous marine life tanks to form a complete exhibit experience. 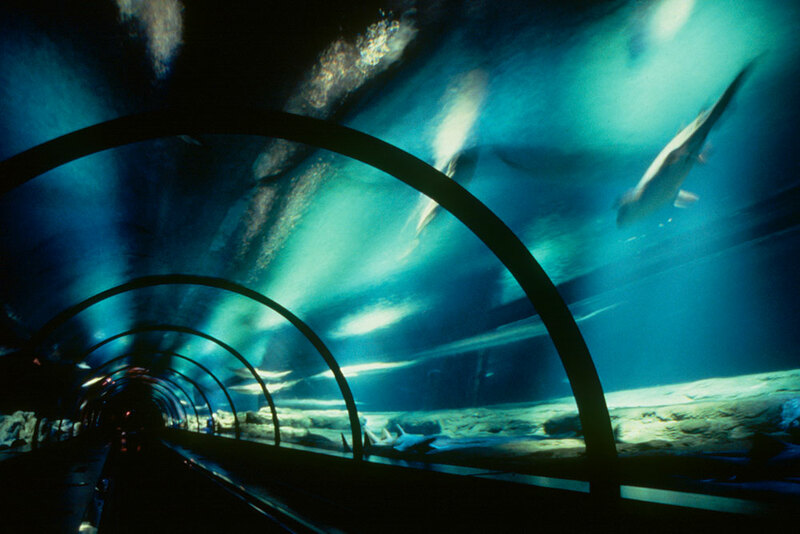 Without any natural light made available in the aquatic enclosure’s plan, the electric lighting design was tasked with providing a convincing, habitat-responsive sea environment. 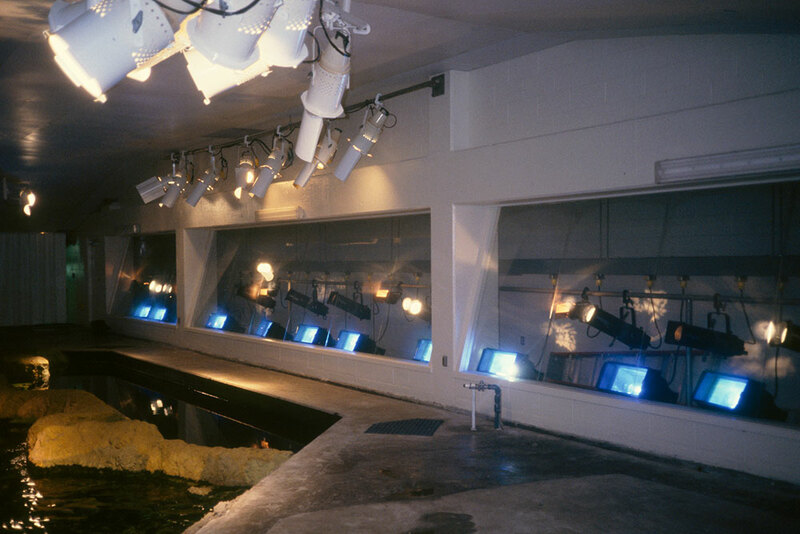 Much of the Caribbean coral reef underwater sensation was created by lighting equipment sealed within a hidden overhead projection space adjacent to the void above the tank. The above-water cavity’s ceiling and walls were painted matte white to allow for their use as light projection surfaces. An artificial sky was simulated by illuminating the entire volume with blue-filtered 1,000-watt metal halide floodlights; combined with twelve pattern projectors controlled through a slow cross-fade sequencer to simulate constantly moving clouds. PAR spotlights mounted directly within the open cavity mimicked direct sunlight from a constant midday angle. 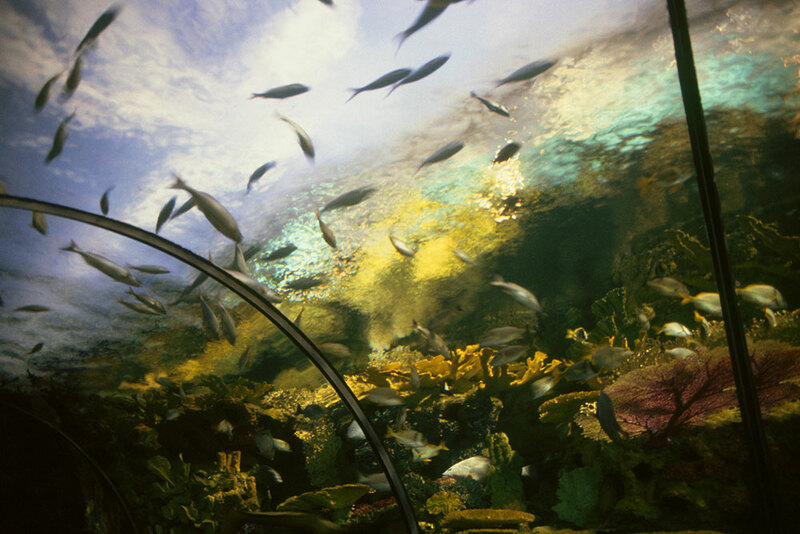 With visual distortion created by the continuously active water surface conditions, views for the visitors from inside the walk-through acrylic tube at the base of the coral reef were completely convincing and reinforced the experience. One other unique but not so successful enhancement, integrated fiber optic bundles throughout the artificial coral formations to help reveal the eels in the shadowed recesses. Unfortunately, the slithery occupants did not care for the intrusion and, once they introduced to the habitat, they proceeded to chew off most of the lensed fiber end points. 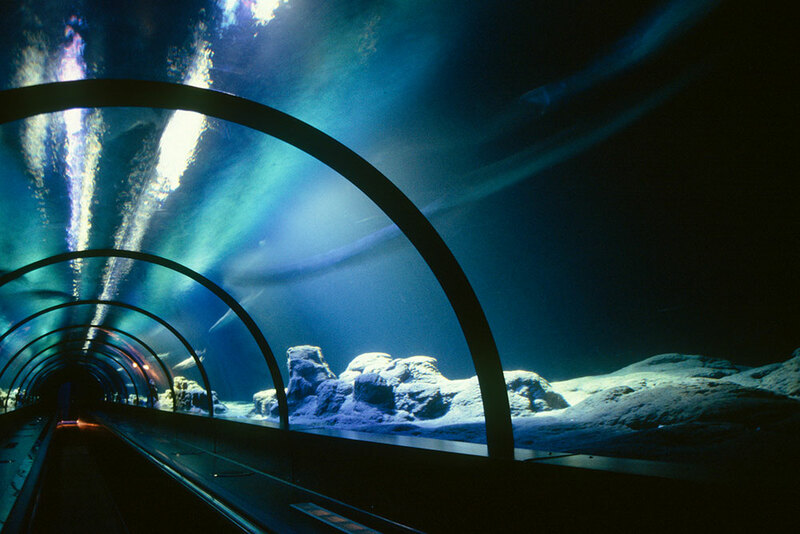 Although the tank was only about 15’ deep, the environment simulated is that of an open ocean – a deep, dark environment where you cannot see the surface. What light there is at this depth is greatly attenuated by the salt water and longer wavelengths are significantly diminished. Light seen at this depth has a bluish cast. Several different dichroic filters were used to emulate the deep blue ocean color, and it was controlled to continually cross-fade, enhancing the sense of depth. The lighting was dimmed along the perimeter walls to create the effect of the sharks swimming in toward the visitors from a great distance, dramatizing their emergence out of the darkness. The success of the project led to more aquarium work, including Sea World shark habitats in San Diego, open ocean tanks at the National Aquarium in Baltimore, and similar projects throughout North America.